Following Alex Salmond’s outlining of the plans for the referendum on Scottish independence, Ed Jacobs stresses the need for a positive vision of the future. As 2012 began the prospect of Scottish independence seemed a distant thought, relegated by the SNP to a mere promise to hold a vote sometime in the second half of the current Scottish Parliament. Having indicated on the Andrew Marr programme just a matter of weeks ago that he wanted a vote sooner rather than later, little could David Cameron have imagined the speed with which the details of an independence referendum would be revealed. In the space of just a few short weeks, we now have a date for the vote, Autumn 2014, and after yesterday’s announcements from Alex Salmond a suggested question; a proposed electorate; a pledge that the Electoral Commission will oversee the vote; and suggested spending limits for the campaign. Indeed, we now also know that the SNP’s preference is to keep the pound and establish a Scottish Defence Force. All of a sudden, independence is no longer an abstract idea, but a very real decision for Scotland to take. And if the latest polling, surveyed straight after the publication of the Scottish government’s consultation, is to be believed, those in favour of an independent Scotland are now just 1 percentage point behind those favouring the Union. Make no mistakes about it, the game is on. Yet for all the bluster from the SNP about full independence, as Professor John Curtice has pointed out in the Scotsman, the long term polls show that Salmond et al have a mountain to climb if those south of the border will be needing to wave their passports as they past Hadrian’s wall. Hence Salmond’s calls for the option known as “devo max” to be included on the ballot paper as an option. Whilst recognising Matt Gwilliam’s argument on Left Foot Forward that the option opens a whole can of words, it would seem a travesty not to use this as an opportunity to settle Scotland’s future for a generation, once and for all. b) That, as Labour have argued, it is best to clear up the issue of independence and then consider further powers under devolution. It has to be wondered, however, how Scotland’s economy would react to still more uncertainty about what powers Holyrood may or may not have. Salmond was right to argue Scotland is faced with the most important decision it has made for centuries. It would be perverse then to exclude from the debate the option which clearly has majority support from the people of Scotland. “YouGov, ICM and Survation all find that more or less as many people think the referendum should take place this year or next year as reckon it should not take place before 2014. Political fall back it might be for Salmond, but the numbers clearly show that Scotland wants the option of devo max. If the “respect” agenda is to mean anything and if the referendum is to be truly Scottish-led, the voices of Scotland need to be heard. What is more, for progressives in favour of the Union, it is Devo Max that provides potentially the best source of common ground around which they can unite to support a positive vision for the future of Scotland. Already the Liberal Democrats have indicated support for “Home Rule” whilst the former Labour first minister, Henry McLeish, has pledged to lead the campaign for this option, echoing support for it voiced by the senior Scottish Labour Peer and former MSP, Lord Foulkes. Progressives against independence need a way out. They need to be able to tap into the deep-rooted hostility across Scotland to the Conservatives currently fuelling their desire to run things themselves away from the nasty, regressive, savage Cameron-led government. “It is understandable for supporters of home rule, not just in Scotland, to be squeamish about engaging whole-heartedly with a process shaped by formidably effective separatists like the SNP under the leadership of a man whose hero is Parnell. But it could also be disastrous to stand aside from it. “The home rule option could open the door to a wide-ranging British democratic revival, of which directly elected mayors would also be part. Civic Scotland, and civic Britain, need to engage with that home rule alternative, to define it, refine it, promote it and assert some shared ownership of it. This is big stuff for all of us, as Wales’s first minister Carwyn Jones has been quick to grasp. “The short three months’ consultation that Salmond has announced is a vital period. But it does not matter for the SNP government and Scotland alone. If any of the four countries in the United Kingdom leave the United Kingdom then use the Barnett formula to allocate their fair share of the national debt. Rubbish, the passport bit and of Curtice’s position. Ever been to Eire and needed your passport except perhaps at the Easyjet checkin? Ever traveled between Denmark, Sweden and Norway? Passports at Greta is part of the big Unionist policy of lies, smears and fear dissemination. It is not working and is well past its sell-by date although certain key elements in Labour haven’t twigged that. Maybe we should keep that wee secret quiet as we have sussed it. Of course you might be just writing tongue in cheek? A propos Curtice, he doesn’t have a very good record of using the past and his version of the polling present to predict the future. Is he by any chance a member of the Labour Party like Prof Pennigton ho is wheeled out by the BBC to sagely back up smears on the SNP on their success in reducing hospital infection rates. So sage is he that Jackie Baillies statistics came from a period when Labour were in charge at Holyrood. Maybe he is a Labour Party member too. Either that or he can’t do calenders. Keep it up, we are gaining members by the hour with this opposition. Perhaps, if we were to all aproach the constitutional debates in the UK from the perspective of looking for genuine democratic answers instead of political “victories”, we could then let posterity figure out who were the “Progressives”. And you had to use the “S” word as well! Sigh! Are those among the unionists who want to take us out of the EU “separatists”? Does this kind of labeling even help us to look for democratic solutions that can be accepted by the majority? The Left no more own this process than the SNP and we all need to be open to differing views if we intend to deliver on the publics aspirations rather than point score and close down debate a la Paxman. The SNP have an agenda without doubt – everyone does – but at least they are keeping the door open. If the progressives feel it will be easier to enthuse public opinion for constitutional change post a victory for the “status quo” [which wont actualy exist after Cameron “fixes” the west lothian question] then nothing will come of the Civic Alliance. It is very generous that so many English are willing to cede all their territory north of Hadrians Wall. Great to see that academics will be banned from being members of political parties in an independent Scotland. Unless, of course, they are members of the SNP. That will be just alright! I agree that those people who call for Scotland to remain in the UK, while calling for the UK to come out of the EU are disingenuous at best – hypocritical at worst. I think we need to be careful about terminology, Unionist is surely someone, like the conservatives who want to maintin the union as it was pre-97. Even today there are many in the cnoservative party who hate the Holyrood parliament, and desire its dissolution. i would say that Labour – and the Lib Dems are generally devolutionists, ie those who want devolution of power to the Scottish people in the form of the Scottish Parliament. There may be difference in what powers they want to be devolved, but this is surely a matter of degree. Then you have the seperatists. I think this is a more honest term than nationalist, as surely you can be a nationlist while also being one of the other two? For centuries we had proud Scots who were satisfied with the Union as it was post 1707, or those who wanted a devolution/Home Rule. But the idea of seperation is not what defines someone as Scottish. I presume you would use the same formula to apportion assets too. I’m not denying anyones right to define Scottishness their way but as independence in the modern world is virtualy impossible without a degree of inter-dependence (like Britain in the EU or America in the IMF) it is pejorative to label Scottish Nationalists as “separatists” especialy when they are pursuing an agenda of social union. Some have even described Salmonds brand of nationalism (as a political not social label) as closer to confederation. I also disagree that Labour and the LibDems are both devolutionists. The LibDems call themselves Federalists, which is not the same thing as the lopsided devolution of power that has been devolved to some of the parts of the UK. I personaly, do not want to see the devolution model continualy patched as I do not believe it to be equitable to all residents in thes islands. Does that entitle anyone to characterise me as not progresive. Labour are betraying themselves by refusing to grasp the thistle and accept that whatever constitutional changes are implemented in the next years, they need to be “fair” to all. This rules out the soon-to-be no more status quo and any other form of asymetrical devolution. I thought Scotland wanted 100% of the Oil? 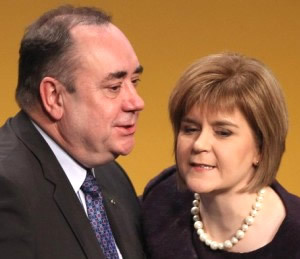 Are you saying that they will accept a Barnett formula share of that? Oil not an asset. So its free and worthless. The rump can keep the lot then. Yeah we get it though. You want a Barnett formula share of the cash now, because its more than your fair share. On break up you want to take less than your fair share. You don’t want to take on RBS and HBOS and their bad debts. You want to keep sterling, but won’t knuckle down to the imposed financial conditions that come with that. You want the rump to sign you up to the EU. You want payments for development from the EU, paid for by the rump.